The 1. 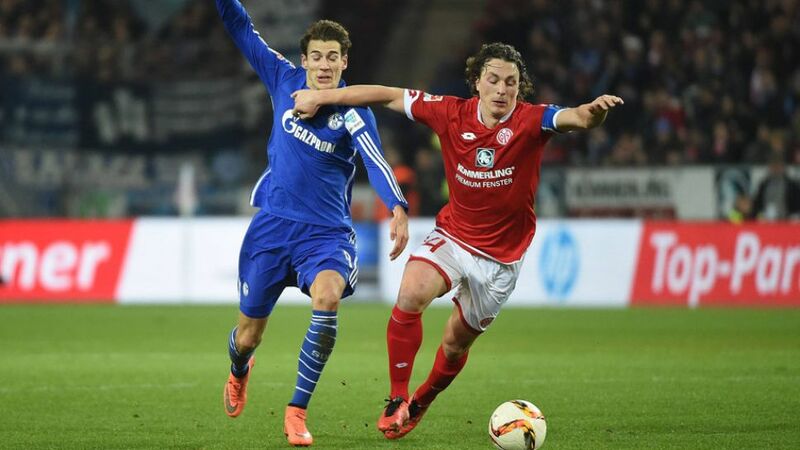 FSV Mainz 05 camp were thrilled to keep up their fine run of form with victory over FC Schalke 04 on Friday night. Julian Baumgartlinger (Mainz captain): "I think everybody had been waiting for me to score a goal. The coach and the team couldn't quite believe it. I just saw the gap and closed my eyes. The most important thing, though, is that we won 2-1. In the end, my goal was a bit lucky but we're happy to take the points. Things are just going well for us at the moment." Martin Schmidt (Mainz head coach): "It was a really lively opening ten minutes. We knew it was going to be difficult defending against Schalke, but we did a good job on the whole. We may have conceded one, but we looked solid generally. Julian Baumgartlinger has had to wait a long time for this goal so it's nice that it was such an important one for us. I want to pay my team a huge compliment for this performance." Gaetan Bussmann (Mainz defender): "I just let loose for my goal – some days it goes in, on other days it doesn't. It was an important win for the team." Danny Latza (Mainz midfielder): "We're delighted to have won three games in a row. We came into the game with a lot of passion and we wanted to defend well, which is making a big difference for us right now. And if Julian scores a goal, then we've really got to win." Giulio Donati (Mainz defender): On Instagram "Let's keep this going"
Andre Breitenreiter (Schalke head coach): "It was the tough game we expected it to be. We got into it well and looked to be on top, and we had the first chances with Klaas-Jan Huntelaar and Leon Goretzka too. Apart from a [Jhon] Cordoba effort, we didn't really let them have a sight of goal. Suddenly, they then took the lead out of nothing. We just didn't defend well enough. In the second half, we got the equaliser straight away and we put them under pressure for 15 minutes, pushing for a second goal. Unfortunately we didn't find it and then their second goal came out of nothing once again. We tried everything in the end, but unfortunately we go home as losers after this tight match." Johannes Geis (Schalke midfielder): "It was a good first half from us and we also did a lot right in the second half and moved forward well. Overall it was the small details which were lacking. Mainz were strong, tactically well organised and in the end they had that bit of luck on their side. It's always hard to play in Mainz. We saw after the interval that there was more in this game for us and that's what makes this a bitter defeat. We've had a couple of good games and I think it's normal to have a setback, but now we've got to do better in our next game with VfB Stuttgart. First, though, we've got to think about our Europa League game against Shakhtar Donetsk." Ralf Fährmann (Schalke goalkeeper): "I think it was an attractive game for the fans. Mainz fought really hard. We came back into it well at the start of the second half, but on the whole you've got to say that Mainz did a better job than we did. Mainz are in exceptional form right now and they took their chances better than we did. They deserved to win."